The First, and doubtless still The Best. "Look, I am solidly aware that an electromagnetic African-American Super is a total cliché. My apologies. I didn't order this power off the menu, I swear." In 1977, DC Comics revealed their first headlining African-American superhero with Black Lightning. However, due to numerous controversies and licensing disputes, in the many, many adaptations of the DCU he has often been used via Captain Ersatz. This eventually developed into a consistent pattern in which African-American superheroes, or black superheroes in general, had Shock and Awe powers. Naruto has an entire nation of these. The Land of Lightning is the only one with a visible black population (they seem to be the nation's majority even) and lightning is their most common elemental power. Raikage, Killer Bee and Darui are the most prominent, with Darui even having black-colored lightning that he can shape into a black panther. Ur-Example Black Lightning. Most other examples are deliberate Expies or Shout Outs to him. His daughter, Jennifer, inherited his powers. Keep in mind, Black Lightning originally had no natural powers - he just jury-rigged his own electricity weaponry. You're gonna be seeing a lot of him on this page. Static of Milestone Comics, published through DC. One of the more well-known examples of Black Lightning Expies. Possibly more famous than Black Lightning himself, in no small part thanks to having his own cartoon series. When Milestone was folded into DC, Black Lightning became his mentor. Storm from the X-Men is a native African woman who uses lightning as her primary offensive power. She's a non-copycat examples, since she appeared two years before Black Lightning, and her overall control of weather makes lightning only one of her abilities. Thunder Fall, a member of the Congolese superhero team The Kingdom in the DC Batman spinoff Batwing, can shoot blasts of electricity out of his hands. Volt from Irredeemable (another Black Lightning Expy too); he's also very self-conscious about the trope. Incorruptible very briefly features a man with electrical powers who is revealed to be a black guy when they fail. DC Comics character Coldcast has "electromagnetic" powers which gives him a slightly broader range of abilities (he can theoretically affect electrons on the subatomic level) but largely boils down to Shock and Awe. Somewhat ironically, while he's a Captain Ersatz of another DC character, instead of being based on Black Lightning, he's based on Jenny Sparks (a white woman) from The Authority. In Kingdom Come Jonni Thunder and Black Lightning have a daughter who has both of their powers, named Lightning. Lightning eventually appeared in the regular DC Universe, except her mother was Black Lightning's ex-wife. Rapture from The Savage Dragon is an Electric Black Girl who can fire and absorb electricity, and use it to fly. Baal Hadad of The Wicked + The Divine, being a god of thunderstorms in an avatar as a black man. In "Godstorm: Hercules Payne", a spin-off of Grimm Fairy Tales featuring the titular demigod, Andre Payne is a black man from the streets of Compton who discovers that he's the eponymous son of Zeus. After Zeus 'activates' his powers, Andre finds himself capable of discharging electricity from his hands. In the New 52, the "wizard" who gives Shazam his powers is actually Mamaragan, an Australian lightning god, who appears as an Aborigine man. Marsha Bradley from Image Comics's Savage Dragon is an African American woman with electricity based powers who goes by the alias Lightning Lady. Generations (Marvel Comics) makes Canon Immigrants of the Next Avengers (see under Films—Animation below), including Azari T'Challa, confirmed here to be the son of Black Panther and Storm. Miles Morales has the ability to emit powerful bio-electric blasts as part of his "Venom Blast" attack, an ability not shared by his friend and predecessor, Peter Parker. Next Avengers: Heroes of Tomorrow has Azari, the son of Black Panther; his mother is unmentioned, but presumed to be Storm, given his white hair and electrical powers. He also has his father's strength and agility. Miles Morales's Venom Strike is a bio-electric attack in Spider-Man: Into the Spider-Verse, and Miles is black and Latino. Electro in The Amazing Spider Man 2 got Race Lifted and is played by African-American actor Jamie Foxx. Like his comics counterpart (and befitting his name), he has electric powers. Storm from the X-Men Film Series, first played by half-African-American actress Halle Berry, has control over the weather and often uses lightning when called upon to use her powers offensively. In The Amazing Extraordinary Friends, Wired is the New Zealand equivalent: being a Maori with electric powers. And of course, Black Lightning's back. Aberrant supplement Aberrant: Year One includes the NPC "Electric" William Greene, an African-American "nova" with electrical powers. Crimson Viper from Street Fighter IV appears to be, at least, of mixed ethnicity. She also has a pair of hi-tech, electrically-charged gloves that can be used to perform her Thunder Knuckle technique. Laura from Street Fighter V is a But Not Too Black example. She can generate electricity apparently by running her hands through her hair. Jada in the Battle High series is an electric elemental, and accidentally blinded herself by showing off her powers. She now "sees" using low-level electrical pulses. Mighty No. 3/ Dynatron from Mighty No. 9 is a robot with dark brown skin tone and powers over thunder and lightning. Mega Man Battle Network: Raoul, a black man whose Navi ThunderMan is an Elec Navi. Jiggawatt of Grrl Power. She is an Expy of X-Men's Storm and may also be a conscious (though female) evocation of the trope. Whateley Universe: Jamal Castle, codenamed Jolt, a Electrical Energizer, meaning he has some electrical abilities, and is black as an episode of his Power Incontinence was described as "The black kid yelped and suddenly erupted in a crackling field of arcing electricity" . Black Vulcan from Super Friends, created as an Captain Ersatz of Black Lightning to save on licensing fees. Though some speculate him to be Jefferson Pierce with a different moniker. Juice in Justice League Unlimited (whose whole team consists of Expies of the Superfriends). Soul Power, a retro funk character from the Static Shock animated series. He was originally going to be Black Lightning, until lawyers got involved. And, of course, there's Static himself. Aqualad in Young Justice primarily has water powers, but has electricity as a secondary one used to electrify said water attacks. 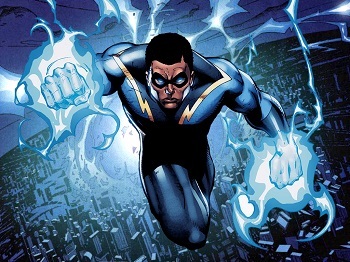 The same show also featured Static and Black Lightning, meaning half the (super-powered) male black cast fit this trope. Black Lightning's lightning is also literally black. Teen Titans has Bumblebee, a young African-American woman who uses a pair of stingers that blast electricity at the targets. She has the same stinger abilities when she appears in Young Justice. Rallo from The Cleveland Show once attempted to become one of these ("Electro-Boy") by shoving a fork into an outlet while wearing a homemade superhero costume.